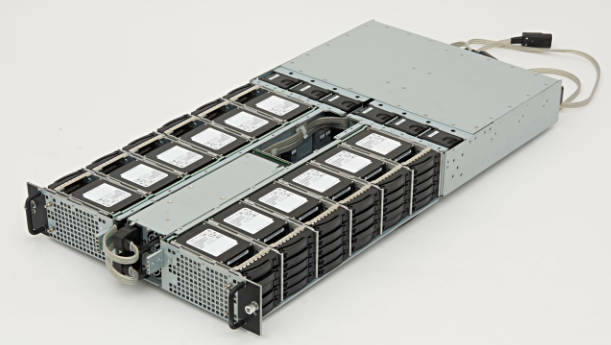 We’re hearing HDS is retiring or downgrading its 11-month-old HFS A-Series all-flash array. We understand this 60 x 2.5-inch slotter is an OEM’d version of a Raid Inc. box which has 30 side-mounted drives either side of a 2U tray. There are six rows of five stacked SSDs per side. Nimbus Data also uses the hardware in its ExaFlash B-Series, we believe. The entry-level A220, costing $125,00 at street pricing, had a 16TB raw capacity rating, with the high-end 270 having 96TB. The HFS array has a unique operating system, HFS Software, which HDS uses 2D (2bits/cell) MLC NAND SSDs in the A-Series with 1.6TB capacity. There are larger capacity TLC (3bits/cell) SSDs available, with capacities as high as 15.36TB (Samsung PM1633a). When it was announced, the A-Series had a quarter-by-quarter roadmap for 2016, featuring replication between it and VSP arrays in the third quarter, and scale-out support in the current quarter. Storage consultant Chris Evans said he thought that the A-Series lacked automated management, needed a scale-out capability and was a candidate for TLC drives. The HDS US website has no good HFS A-Series info, although a PDF infographic mentions it. Ditto the Hitachi Japan site. It’s as if the A-Series has just vanished. HDS HFS A Series all-flash array. A channel source told us that HDS is concentrating on its all-flash VSP F-Series, an enterprise rack-level product introduced in October. It uses Hitachi’s proprietary flash modules and having a 100 per cent availability guarantee. This system runs the SVOS operating system and the entry-level F400 starts at a 14.4TB minimum capacity, rising to 256TB. Its starting (list) price is $218,200, way more than the HFS A220. With SVOS 7 and our FMDs we are able to deduplicate and compress data, delivering capacity savings that match what every AFA product can deliver. Add in our FMDs and quality of service (QoS) technology and we can offer these savings while enabling more predictable performance than competitors. The end result is that we’ve created a power house that makes the HFS A series, unnecessary. Moffitt explains: "Our original objective with the HFS A series was to deliver an entry, all-flash array that could serve as a “starter platform” for transitioning to an all-flash data center. It offered deduplication and QoS functions critical for the entry segment of the all-flash array market. "This was great, but 2 things became apparent with the release of SVOS 7. First, we could meet the objectives (and price points) of HFS A series with VSP F series. Two, customers that were considering HFS A series wanted a roadmap that looked nearly identical to what we are already shipping on VSP F series!" So "we’ve made the decision to announce the end of sales for the HFS A series."